Sony has launched new X9000F series of 4K HDR TVs in India. It has a X1 Extreme processor that promises striking highlights, deeper dark, and vibrant colours. It incorporates technologies like Object-based HDR remaster, Super Bit Mapping 4K HDR and Dual database processing. It runs on Android TV version 7.0 with Sony’s exclusive user interface and also has Chromecast built-in. It has TRILUMINOS Display the reproduces reds, greens and blues accurately. 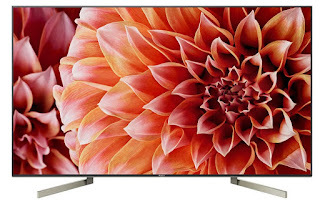 The X-tended Dynamic Range PRO enhances HDR and non-HDR content by boosting and dimming the backlight levels precisely for each zone of the screen with a unique backlighting technology delivering times the XDR contrast of conventional LED TV. X-Motion Clarity shows fast action images clear and smooth by utilizing Sony’s proprietary direct LED local dimming and backlight boosting algorithm to control the luminance and optimize its duration. Therefore, pictures are clear and smooth with virtually no loss in brightness. The TV uses 4K X-Reality PRO to produce stunning detail with Sony’s unique algorithm of reality creation database for any content, such as TV broadcasting, DVD, Blu-ray Disc, Internet video and digital photos. The BRAVIA stand features a simple structure of square, metallic bars that come into contact with the underlying surface at individual points—a design that creates the kind of unique sense of balance and tension that user find in art gallery displays. It has sturdy construction, which uses an inverted V-shape to ensure stability, the stand creates the ideal space for a soundbar, whilst harmonising gracefully with the aesthetics of living spaces. 55-inch Sony Bravia X9000F (KD-55X9000F) is priced at Rs. 2,39,900 and is already available across India. The 65-inch (KD-65X9000F) and 85-inch (KD-85X9000F) Price not yet announced.